The Apple 27" Thunderbolt Display introduces Thunderbolt technology to the market, providing ultra-fast speeds. Thunderbolt is 20 times faster than USB 2.0 and up to 12 times faster that FireWire 800, poising this monitor in a position to change the way you work, play, and more! The 6 ports on the monitor include, of course, the Thunderbolt port, 3 powered USB 2.0 ports, a FireWire 800 port, a Gigabit Ethernet port, and a Kensington security slot. That's a lot of flexibility when it comes to connecting other devices to the monitor. Speaking of other devices, the Thunderbolt Display turns your MacBook into one stunning desktop, but it can also add oomph to your iMac or Mac mini configuration. The glossy 27" widescreen display has an incredible 2560 x 1440 resolution that makes everything you view on it come alive and the built-in speaker system and subwoofer provides full-range audio... which makes the monitor especially nice when using the FaceTime HD camera to chat with family and friends on other Macs. To connect, the monitor simply uses one-cable for Thunderbolt enabled Macs, making it a plug-and-play hub for your entire digital life. Additionally, the monitor comes with the MagSafe connector for powering the MacBook Pro or MacBook Air. Thunderbolt Technology. Built Right In. Thunderbolt I/O technology lets you move data between your devices and your computer with unprecedented speed. With two channels of 10-Gbps throughput in both directions, it's up to 20 times faster than USB 2.0 and up to 12 times faster than FireWire 800. And it allows you to connect as many as six devices through a single, compact port. Now, for the first time, all that power and flexibility is available through a port built right into your display. 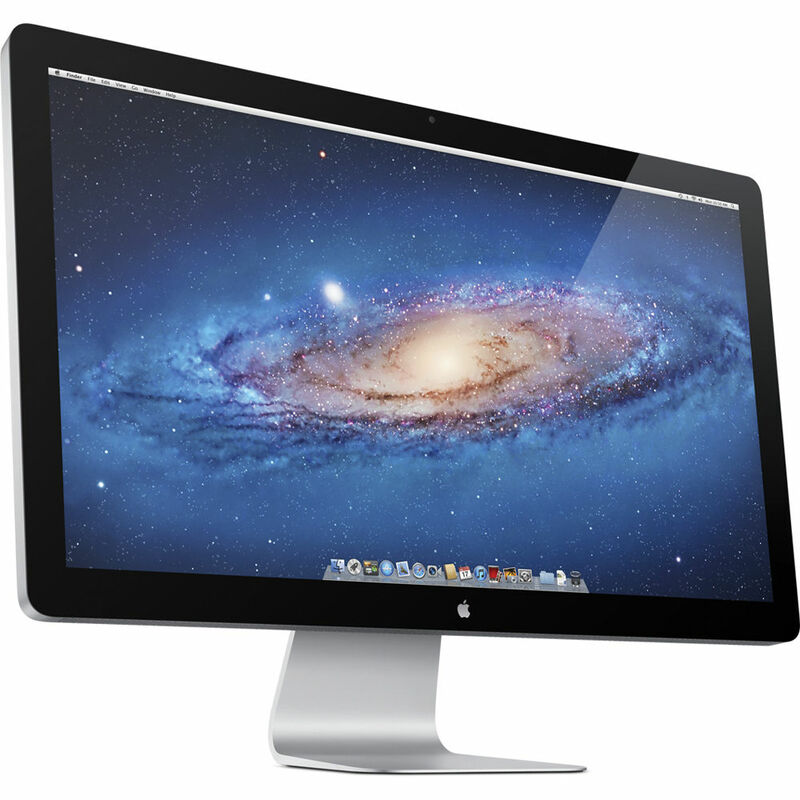 Which makes the Apple Thunderbolt Display so much more than just a pretty screen. Do more with MacBook Air. Expand the capabilities of your MacBook Pro. A bigger display for your biggest ideas. Crystal clear from every angle. Built-in Face Time HD camera and microphone. Box Dimensions (LxWxH) 30.5 x 24.0 x 10.0"
27" Thunderbolt Display is rated 4.6 out of 5 by 158. Rated 5 out of 5 by Romills from Wow...impressed I had an old dell 2404, which I knew was getting old, the LCD was starting to retain images.. I decided to replace it with the 27 thunderbolt, knowing there would be an improvement, I was surprised at the level.. Sharp, sharp images, much better color and contrast. I was worried about the glossy screen, not an issue at all, in fact, prefer it in the location. ( it controlled lighting, no real glare, particularly with the brightness of this display). Love the two plug docking station feature, One for power, the other for network, USB and display.. Was looking at this or the Dell 27, glad I spent the extra $40, for this feature. Rated 5 out of 5 by Number1Photog from Apple 27 Thunderbold Display - Best Display Monitor I have been a photographer & videographer for 28 years. The Apple 27' Thunderbold Display is by far the most reliable and color accurate monitor I've ever used. We now have setup our entire production company with these Monitors. The brightness, contrast & color is alway right on the money when we calibrate them. Prior to going with the Apple Display Monitor, we used other major brands....they seemed to slip when it came with color accuracy....and had to calibrate the constantly. Out of the box, you can pretty much use the factory settings and know your color & contrast is pretty accurate. Rated 5 out of 5 by Dan from Better Than I Thought - Great for MacBook Pro Prior to purchasing this monitor, I wondered what made it so great. I researched to the nth degree and ended up liking the concept of the integrated power cable for the MacBook computers. After receiving it I enjoyed the entire set of features available. The integrated power supply and set of inputs on the monitor increased the input already on the MacBook. The resolution on the display blew away the monitor I purchased in the past. It was clear as the retina display on the Macbook Pro. The auto turn off feature proved just how well this monitor was built for the use with mother Apple production. Now that I purchased one, I am looking forward to purchase a second one. I is worth every penny. Rated 3 out of 5 by JCH from Impressive, but not perfect I got this monitor after hearing it looks beautiful and I was also looking forward to the Thunderbolt connectivity. It's easy to hook up and I love having all the extra ports on the back: network, USB, Thunderbolt. I got this monitor for graphic design and photography, so color accuracy is very important to me. However, it does not have even color coverage across the whole screen, which was very disappointing. It looks good, it looks beautiful, but the bottom right corner of the screen has a slightly yellow tinge to it. Not good. The highly reflective glass is a little bit distracting, but not a deal breaker. The build quality is excellent. This is a high quality display. Rated 4 out of 5 by Chicago filmmaker from love this monitor I use this monitor for film editing and love the additional real estate that 27 gives me. Hooking it up to my 3 year old MAC book pro was as simple as plugging in the thunderbolt connection. The colors are deep and accurate and the screen doesn't have much glare, though I work in a fairly dark room. The automatic brightness didn't work well for me (the screen was too dark) so I turned it off and manually adjust the brightness. My biggest complaint is that there is no vertical adjustment like I had with my Dell monitor, which is why I downgraded to only four stars. Rated 4 out of 5 by Michael from ATD rocks Great 27 narrow gamut IPS screen. The design is a bit dated with USB 2 and FW ports. USB 2 and FW are OK for connecting low speed devices like keyboards and backup drives. Thunderbolt is great for connecting large RAID drives.If you have a Retina MBP. makes sure you get the revision B ATD. It contains the magsafe-magsafe 2 power adapter needed to power the Retina MBPs from the ATD. If you get a revision A display, you will need the separate power adapter for an additional $. Rated 4 out of 5 by wmkphoto from Excellent display; so-so dock The display is excellent. Good color, detail and easy on my eyes for editing photos. Calibrates easy although mine didn't need any out of the box. I love the size, weight and construction. The docking function is a half hearted attempt though. I love the FW800 port, but two USB 2 ports? Not USB 3? Just shows Apple design is far from perfect. I use the USB 2 ports for my Wacom Tablet but still plug my USB 3 card reader into my laptop. While i'm complaining how about one more Thunderbolt port? I find the ethernet port useless so that spot could be used. A nice piece of gear and matches to my MacBook Pro perfect. Looks good. Just needs a sprinkling of up to date tech. Rated 2 out of 5 by Mahesh from Nice but buggy The monitor is very nice, but many people are having problems with these displays. Mine worked for about a month but usb ports were very slow. Also a few times I had connectivity issues that require a computer reboot. However most of the time the monitor worked well with the computer. But then a few days ago it stopped working. Now is completely dead. Perhaps I just got a defective item. My advice is to research the other people's experience (apple support site is good for that) before buying. I have a Mac Pro mid 2012 - will this work with it? The Mac Pro 2012 would not have a Thunderbolt port, so this would not work with your computer. Can you mount the 27 Apple Thunderbolt display on the wall? Negative, the back of the display does not have any screw-holes for mounting. Which anti-glare film do you recommend for this display? Is there any that doesn't affect the colors, brilliance or contrast at all? I have a macbook pro mid2010, will I be able to connect this monitor? If not what will I need to connect it? No. You need a Mac with a Thunderbolt port which the mid2010 Macbook do not have. Answered by: JORGE AOKI J.
whats the ethernet port used for? Plug in Ethernet into monitor then thunderbolt from monitor into computer. This allows you not to have a mac with a Ethernet port. Everything travels from the thunderbolt output into your thunderbolt input on mac. does this monitor come with thunderbolt cables? It comes with only the one T-bolt cable that connects the monitor to your laptop. It's actually a single cable that splits into two components one is the T-bolt connector; the other is the mag-safe charger. The monitor itself also has a cord to plug into an outlet (#duh). I have a four year old Mac Book Pro. I would like to do photo editing with this monitor, would I need to update my software and what cables would I need to purchase? None, it should just plug right in. I have mac pro early 209, will it work with it? I don't think your model has thunderbolt. If you don't have a thunderbolt connection, then no. The display literally has two wires attached- the power cord, and the thunderbolt cable.